Ukrainian servicemen who fought in Debaltseve have set up new positions near Artemivsk, Feb. 19, 2015. Hopes for a tattered Ukrainian cease-fire continued to fade Thursday with reports of fresh fighting near the Ukrainian port city of Mariupol. 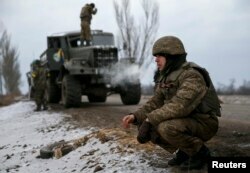 Kyiv military spokesman Anatoliy Stelmakh said pro-Russian separatists - fresh from a victory over Ukrainian forces at Debaltseve - began the heavy shelling of the village of Shyrokyne on the outskirts of Mariupol on Wednesday. The main seaport in eastern Ukraine, Mariupol was the scene of intense fighting last year, before Ukrainian forces took control of the city. Ukraine's President Petro Poroshenko condemned the takeover of a key eastern Ukrainian town by pro-Russian rebels as violating an internationally brokered cease-fire during a call with those involved in hammering out the agreement last week. Poroshenko said during a phone call with the leaders of Russia, Germany and France on Thursday "not to pretend that what happened in Debaltseve was in line with the Minsk agreements" that were reached last week and went into effect Sunday. On Wednesday, thousands of weary and demoralized Ukrainian troops were withdrawn from Debaltseve, a strategic rail hub that links the separatist-held areas in Urkaine's Donetsk and Luhansk regions. In Paris, French President Francois Hollande said he and German Chancellor Angela Merkel spoke with Poroshenko and Russian President Vladimir Putin in an attempt to enforce the cease-fire and discuss consequences of violations. France and Germany, which oversaw marathon peace talks last week in Minsk, Belarus, both signaled Thursday that they're determined to salvage the cease-fire deal and keep Ukraine and Russia talking. U.S. and European officials expressed hope that, with Debaltseve in rebel hands, the cease-fire could now take hold. Also, reporters near the towns of Debaltseve and Donetsk said shelling continued in both areas on Thursday. Local officials in government-held territory said rebels had also fired mortar bombs at another town further south of Debaltseve. Kyiv fears they are massing for an assault near the major port of Mariupol, Reuters reported. According to the cease-fire, both sides were supposed to withdraw heavy weapons in eastern Ukraine beginning Tuesday, but international monitors said Thursday they had not seen either doing so. "We have not observed the withdrawal of heavy weapons, however we have observed and reported on the movement of heavy weapons," Michael Bociurkiw of the Organization for Security and Cooperation in Europe told The Associated Press. In a statement, Ukraine's defense ministry said that 13 soldiers had been killed and 157 wounded during the withdrawal. It also said that 82 soldiers were missing, and more than 90 had been taken prisoner by the separatists. Poroshenko also called on the pro-Russian separatists to release all Ukrainian soldiers, hundreds of which were thought to have been captured by the rebels during the withdrawal from the eastern city. He spoke from Artemivsk, a government-held town north of Debaltseve where the soldiers assembled after they withdrew. Poroshenko called for an international peacekeeping mission to restore calm to the area as well. The appeal was rejected Thursday by both rebel and Moscow leaders. Vitaly Churkin, Russia's ambassador to the United Nations said the proposal suggests Kyiv is trying to undermine the cease-fire reached last week in Minsk, Belarus. "When someone starts to propose some schemes instead of doing what had been agreed, it primarily arouses suspicion that they want to undermine the Minsk agreements," Churkin was quoted as saying by the Russian state-owned TASS news agency. Denis Pushilin, spokesman for the so-called Donetsk people's republic, also said Ukraine's request for international peacekeepers "violates the set of measures aimed at implementing Minsk's February 12 peaceful settlement agreements," according to the Interfax news agency. The White Houseon Thursday said it was “deeply troubled” by reports of continued fighting and NATO's top military commander, U.S. Air Force General Philip Breedlove, said he did not think the truce had ever even begun. “It is a cease-fire in name only,” Breedlove said during a visit to Kosovo, adding that the loss of Debaltseve to rebels was "concerning." The White House said Wednesday that it is "crystal clear" that Russia and the separatists in eastern Ukraine are not living up to the cease-fire agreement, and warned this puts them "at risk of greater costs." Russia insists it has no weapons or forces in eastern Ukraine, despite evidence and reports from witnesses that it has taken a direct role in the fighting. The war in eastern Ukraine has killed 5,600 people and forced over a million to flee their homes since fighting began in April, a month after Russia annexed the mostly Russian-speaking Crimean Peninsula. Meanwhile, Russian Prime Minister Dmitry Medvedev has ordered the Energy Ministry and gas company Gazprom to work out proposals to supply gas to east Ukraine as humanitarian aid, TASS news agency reported on Thursday. Medvedev was quoted as saying Russia should supply gas to the rebel-controlled regions if Ukraine failed to restore deliveries. Also, the International Monetary Fund on Thursday said it is confident Ukraine should get an overall $40 billion financing package to support its economy, without providing details about the breakdown of funds. The IMF last week said its staff had reached an agreement with the Ukraine government on a new economic program with about $17.5 billion coming from the Fund and additional resources from the international community.